One of the locals who's sailed all his life says I'm quite right to stick with a tiny boat that you can get into the water on your own. He had a big yacht in the drive for years but seldom took it out. Since I painted the Optimist he's got all enthusiastic, & says he ought to get a dinghy again. 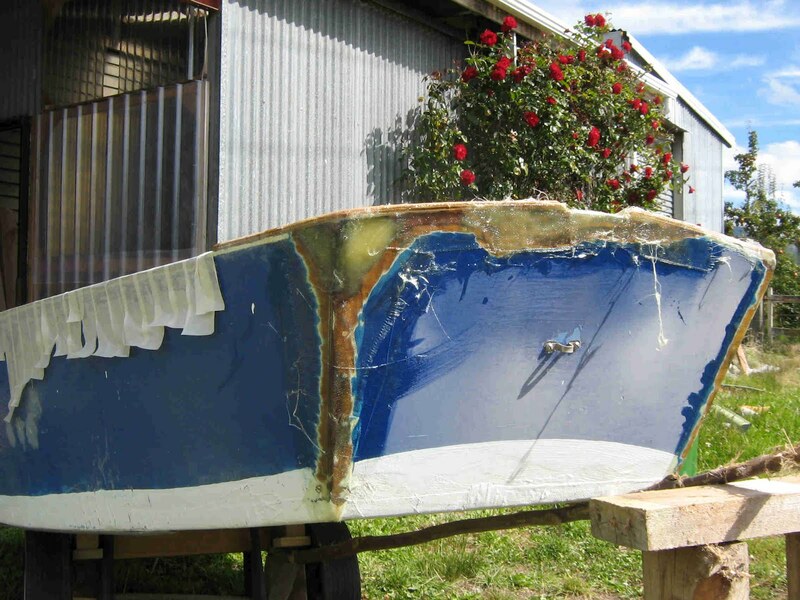 He told me a rounded hull in a small boat is not as stable as a hard chined boat, and when you get down to Optimist size the flat box shape is best. Which is zackly what I've found. You push it off from the beach and when you jump in, the wide flat bottom stops it tipping straight over. He said a clinker-built boat of that size is more work to make, more expensive, and doesn't perform as well. Which was trés interesting, because I've always known you can't scale Nature but hadn't twigged there were certain critical sizes in boat design. He told me that the next size up from the Optimist, the P-class, popular and faster, has a heavy, decked hull and one person can't pick it up and move it around. His favourite ever dinghy was a Junior Sunburst but Googling has failed to elicit anything other than the fact that it was nine feet long. The Optimist is designed for one kid up to the age of fifteen. When John and I were in it together it was Dead Slow, and only fun cos John spent the whole time laughing at me. There's something mathematical about displacement which you could probably calculate though it's complicated by the curve on the bottom of the boat, and there's something else to do with (mass on board = stability) versus (sail area = speed). Obviously I'm thinking about building a boat even though I probably won't. One parameter is the amount of space inside the van, so a boat could only be 3 inches wider and 19 inches longer, and then it would be heavier and cumbersomer and need a bigger sail which I'd have to buy and sails are trés expensive whereas the Optimist cost $400 eight years ago and doesn't owe us anything. There are lots of Optimists and they're about $200 to $800 for a wooden one and the wooden ones are indefinitely repairable and the plastic ones are dearer. Edward Heath says in his autobiography that the most fun he ever had was sailing dinghies, and I think I now see why. A bigger boat would require a trailer and a trailer would need a Warrant of Fitness - a MoT - and would take longer to rig and get into the water and I bet I'd not use it hardly ever at all, if you can use something not hardly ever at all. Sailing stops when you find wet soggy patches and have to sand & dry & fibreglass & let it harden & paint it and I can tell you that nobody ever saved money on disposable rubber gloves, but I'm not going to in case you suspect that I tried to and got epoxy all over my trousers. The soggy patches were on the front right corner and the back left corner and the starboard gunnel. The starboard gunnel is the right-hand top bit, but We Sailing Folk have special names for everything to make You Landlubbers feel insignificant and inferior. - You will detect all the zeal of the convert, a sort of combination of crass ignorance of what I'm talking about and over-exuberant evangelism. People who actually know about boats ruminate thoughtfully and don't talk about it, which is the biggest lie I've ever told because if you go to a library you'll find shelves of books about sailing. Except here. Where there are barely a handful of books. Which is moderately bizarre given Motueka's proximity to the sea. There used to be a book called Low Resistance Boats by a Thomas Firth Jones and luckily I made notes, but when I went to check something I found they'd discarded it as being old. I think the librarians have only a vague grasp of what a library's for. These days it's packed out with tourists on laptops rather than books. Anyway, I have applied vast amounts of epoxy and fibreglass and in a fortnight I'll be able to go sailing again and the wait doesn't bother me a bit because I've discovered you need two things and they have to coincide. You need a lot of wind and a high tide. Tides of 3.7 metres aren't enough in the lagoon because you have to tow the boat through acres of mud before you reach water deep enough to deploy the keel. And morning sailing is rubbish because the land warms up during the morning and there's no wind till lunchtime. So there are only a few days a fortnight when it's possible. A beautiful repair. So why does Mr. Knight make cruel remarks about my workmanship? When both apply - wind and tide, that is - then it's a merry hour of adrenaline because an Optimist is only slightly bigger than a plank of wood and when the wind whips up the lagoon presents waves higher than the side of the boat. And you can ignore that stuff about baling because when you're watching every wave and the wind's blowing 25mph and you're hanging onto the mainsheet as if hanging onto the mainsheet's going to be of any help, then you haven't got time or a free arm for baling. It's a fraught business, I've learnt. You're trying to balance inside a tiny floating box in big waves with no control of the accelerator and little control over direction or stability. The error penalty is being tipped into the sea, plus or minus drowning. The sole benefit is that should you survive, all those books by Uffa Fox start to make sense and you begin to understand what a weather helm and a lee helm might be and what luffing is and why gybing isn't as safe as tacking and what all of those strange words mean anyway. And I see the programmers who did my computer didn't sail because there are red wiggly lines under luffing and gybing, so here's my glossary, a mercifully short one because I'm a novice and haven't yet found out what the front right and back left corners are called. Gunnel. A gun-wale. A wale is a plank though I don't know why. I thought it was called a strake. The guns were poked over the top, obv., so the top plank is called the gun wale. Sheet. A rope. Gah? Why? Sounds like a sail. I suppose sailing predates comfortable beds, a relatively recent phenomenon. And what did Vikings do? Starboard is the steer board, and it goes back to when William the Conqueror knitted the Bayeaux Tapestry and revealed that he didn't have a rudder so he had to stick a big wide steering oar over the right-hand side, and since it got in the way of docking at Southampton or wherever he did dock, he called one the steering board and t'other the port side. My, I'm clever. One day I'll grow up and go and study linguisticks at UCL where they occasionally wheel Jeremy Bentham's corpse to academic meetings and Minute him as Present but not voting. Nope, not joking. He had himself publicly dissected and stuffed, both according to his will. He founded UCL and his body is kept on public display in a glass-fronted case a bit like a large phone booth and you can go and see it if you want. They messed up his head so that's only a wax model, but the actual head's preserved somewhere, I forget where but I bet you could Google it. All you really see is his clothes stuffed with straw but I believe his actual skeleton's inside, probably held together with a few bits of gristle. Gruesome, eh? Rumour always had it he was Minuted as 'Present but not voting' at all meetings, but actually I think it was only twice. Exceedingly clever man, and one of the early champions of women's rights. - We lack a Jeremy Bentham here in Motueka so we always take our visitors to the top of Takaka Hill where there's a tumbled-down shed in which a cow mummified itself many years ago, and everyone just loves it. It's called The Dead Cow Walk. We tell them in advance and they get all excited and morbid, and we do the whole walk and there's no dead cow, and as we walk back to the car park they get all miffed and say 'Where's the dead cow then? You promised us a dead cow' and we point them to the crumbling wooden shed in the little field next to the car park and they go over and get all spooked out, because it's a complete skeleton with the skin entire and intact, but everything inside has been eaten away. Looks a bit like a fibreglass model, and everyone thinks that's what it is at first. Eeeeeee. All your friends' children think they're in heaven. - Actually, if you visit the Moyses House Museum in Bury St Edmunds they keep a book of the Red Barn Murder trial which is bound in the skin of the murderer. Now that is gruesome. I saw it when I was twelve and have never forgotten it. Yeuuuuuuuuuuuuuuch. When I was a Penniless Student Oaf I and some fellow Oaves attempted to steal Mr Bentham but he was off being re-varnished or something.